How has your weekend been? I hope everyone has had a restful and enjoyable one! 😊 Ours consisted of a family birthday party for our nephew, a drive through the mountains, watching football, eating wings, and going to a pumpkin patch today!!! Oh, and if you follow me on Instagram HERE, you know that the temps in Chattanooga dropped so I was able to FINALLY pull out my chunky knits Friday, Saturday, AND today. I would call that a pretty successful fall weekend! So we made a little fall weekend getaway with my parents to Charleston, SC last weekend. Have y'all ever been to Charleston? If you have, you'll know what I mean when I say it is seriously THE most charming and lovely city! It is full of history, amazing food, and the best shopping. We arrived in time for dinner on Thursday, and when we woke up Friday it was time for a day of sightseeing. 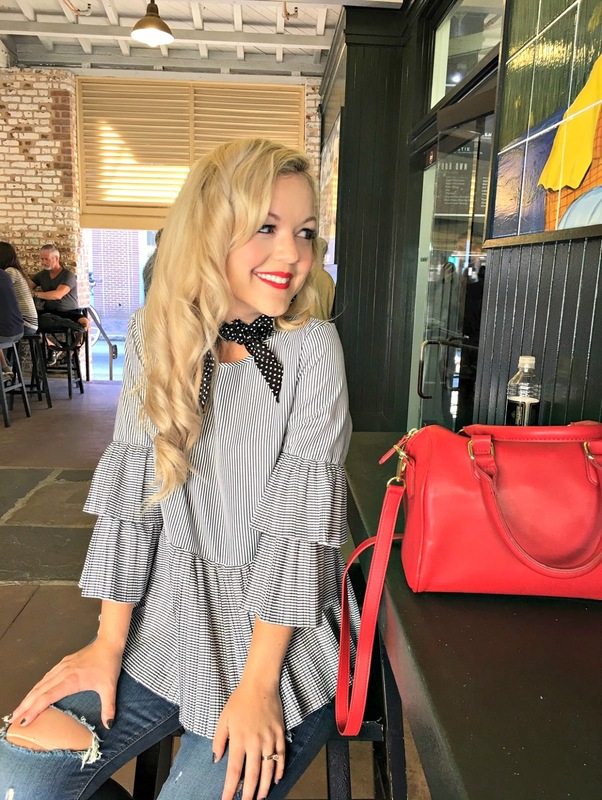 The outfit above was my ideal outfit for exploring Charleston. The temps were in the mid 70s, lower 80s, so I didn't even have to bring a coat. I'm so sad this cross body bag isn't online BUT I will say that I highly recommend a bag like this one which is roomy enough for all your travel essentials, but is a small enough size to be able to wear it cross body. 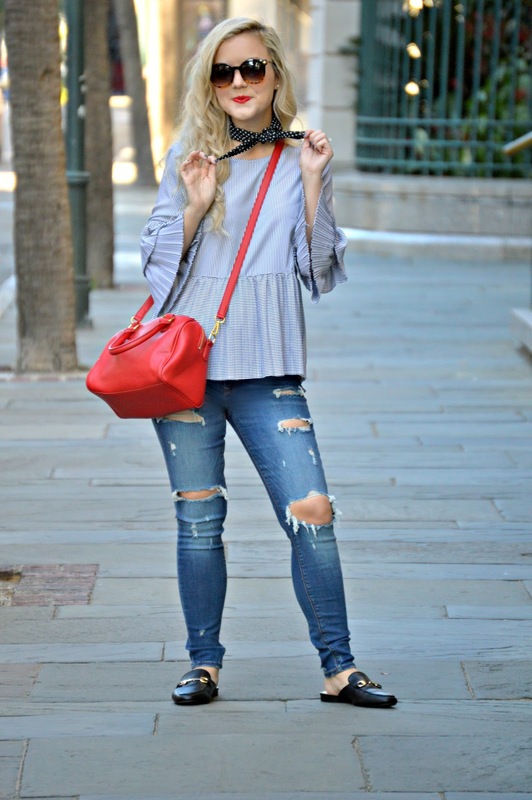 It's so much more comfortable to have your hands free and not worry about a bulky purse when out exploring (plus, it's also safer to wear your purse in this way to keep it close by when out!). 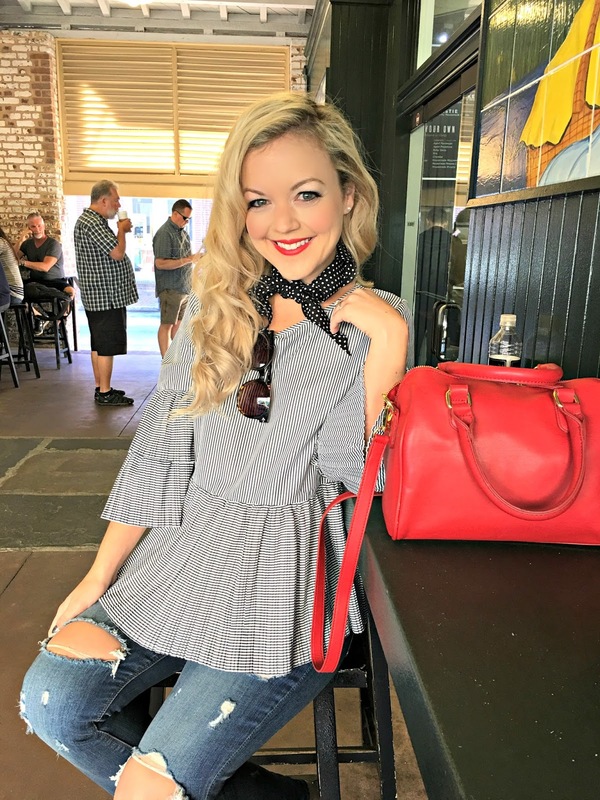 Ok so, let's talk about this top: I am in LOVE with the stripes and ruffles!! 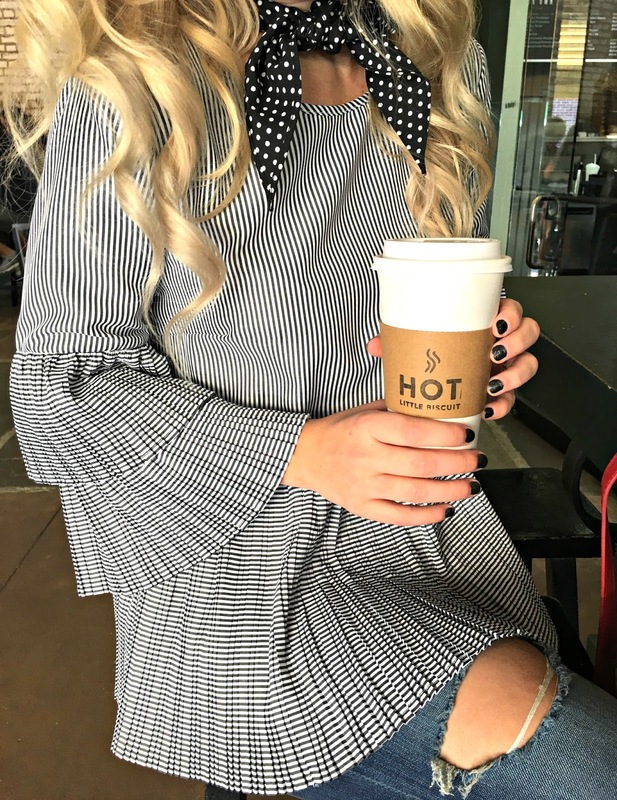 I have linked similar styles above since this one is from a local boutique. 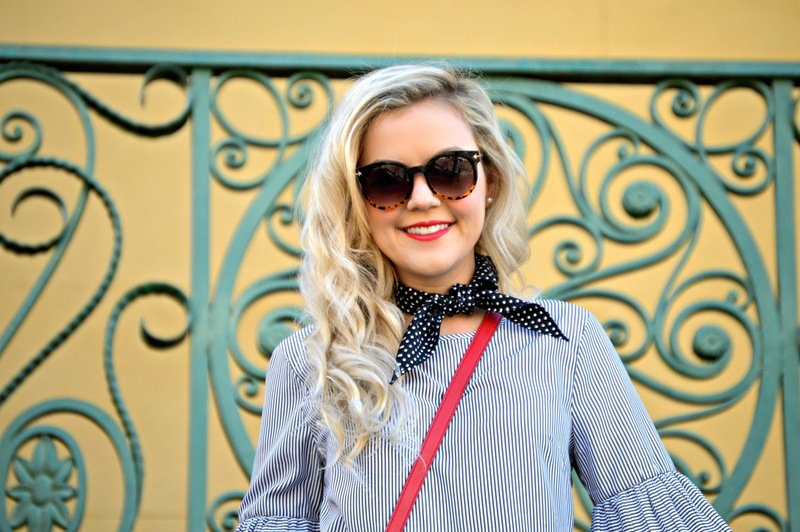 I decided a polka dotted neckerchief was JUST the touch of southern charm this outfit needed. The trick for print mixing? 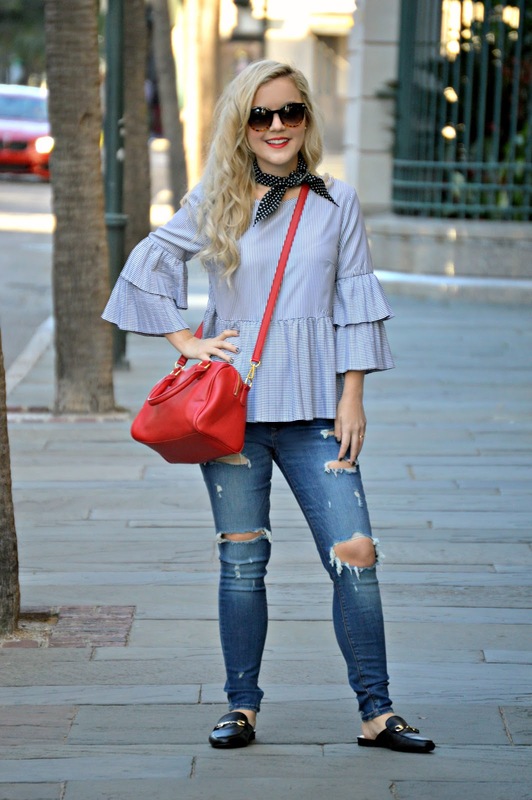 Pick similar color palettes (both of my shirt/neckerchief are the same color, so even though they are different prints, they work well together!). Finally, I am sure it goes without saying, but for me, comfortable but stylish shoes are a must when I'm on my feet all day! These from Target are seriously so cute (a Gucci dupe), and comfortable! My feet didn't hurt at all after walking all day. 1. Take a Carriage Ride (we were very happy with Palmetto Carriage Works we used here, and there are usually coupon codes available online so search before you check out). We took a carriage ride after we went to Fort Sumter and ate lunch at #7 below, and it was a great way to tour the city and see the beauty of Charleston's buildings, and also to figure out other things we wanted to do for the rest of our trip. Our tour guide was also very knowledgeable about much of the history of the city. Plus, how cool is it to be riding in a horse-drawn carriage next to a car?! haha! Pretty unique experience. Also, a tip: we booked our tickets about 1 hour before our departure time online. They run every 15 minutes, so it's super easy to find a time that works with your schedule! I would book a carriage ride earlier in your trip so you can see the city up front. 2. Tour Fort Sumter (tour information here): This is definitely a must-see if you have never been to Charleston. You take a ferry ride to the Fort, which is fun in itself to see Charleston and the Fort from the water. There are certain times the tour leaves which are available on the website, so you definitely want to plan ahead (but depending on the season, you can buy your tickets when you get there. Summer is the busiest though). Also just a FYI: I recommend bringing your own water bottle. They do have water available for purchase once you're on the ferry, but there's no water available while you wait for the ferry to arrive or while you tour the museum prior. Just a tip! 3. 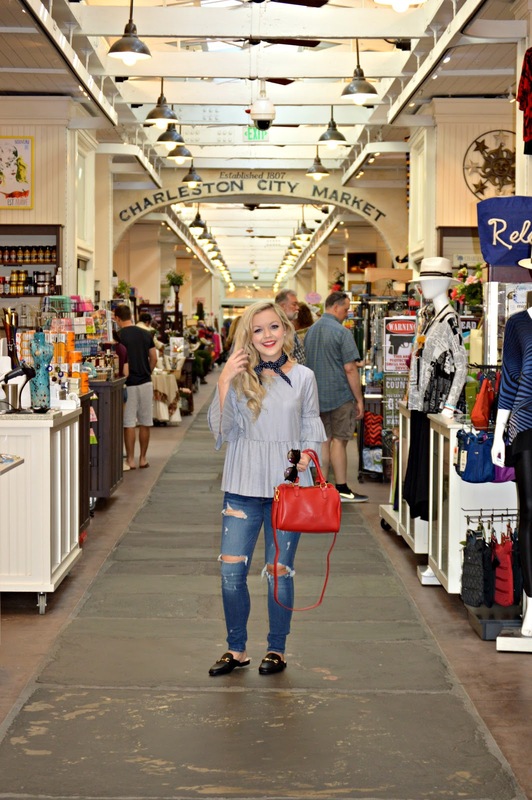 Shop at the Charleston City Market (here): Oh my gosh y'all, this was one of my favorites! The Market was seriously SO cute and had so many unique, NICE things! On weekends, they also have a night time Market from 6:30-10:30 with different vendors and music. It's definitely a must-see. 4. Callie's Hot Little Biscuits for Breakfast (here): So this was a place I heard about from Draper James' Instagram page. There are two locations, and we visited the one inside the City Market before we went sightseeing for the day. I highly recommend the blackberry & the cinnamon biscuits (we got 3 mini ones each to try a few different kinds). DELICIOUS! 5. Visit Rainbow Row (here): I am SURE you've probably seen pictures of the adorable, brightly colored homes on Rainbow Row in Charleston. We took an Uber ride (tip: both Uber and Lyft are available in Charleston, and it is a great inexpensive way to travel between locations because trust me, you can wear yourself out walking here!) to Rainbow Row to take some blog pics (coming soon y'all!). This is a must-see, the houses there are just so gorgeous and it's fun to walk around and see how they decorate the outsides (and the pretty window boxes). 6. Dinner at Circa 1886 (here): This is definitely a Charleston experience! It is a great option for a nice, upscale dinner. The food is DELICIOUS, and it has a lovely ambiance. I would recommend reservations! We made them via OpenTable before. 7. Grab lunch at 5Church (here): I love a restaurant with a unique atmosphere and ambiance. This place is in an old church, and it's just beautiful on the inside. The food is a bit unique for my liking (haha) but my hubby said his oysters were some of the best he's ever had. I would definitely recommend going here for the unique experience. 8. Experience a Rooftop Restaurant (we loved the one we ate dinner at our last night, called The Watch: Rooftop Kitchen & Spirits inside of the Restoration Hotel. Check it out here). 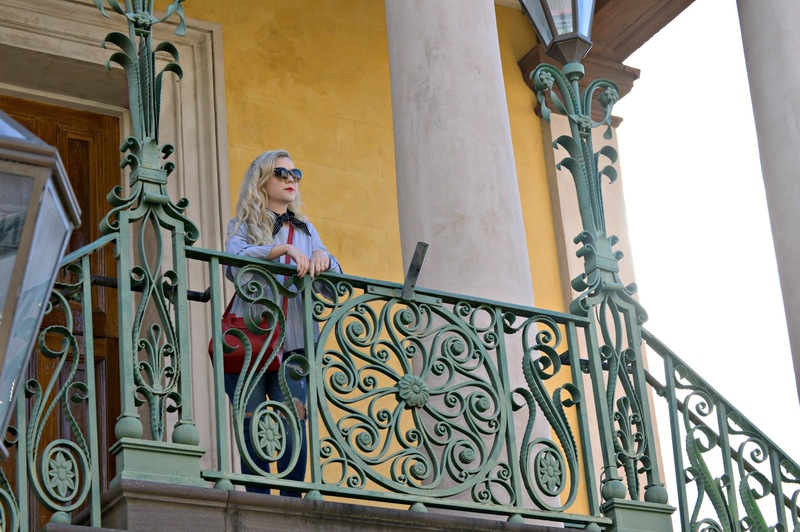 So, you MUST experience Charleston from a rooftop if you go! There are countless spots around town, but we found this one and loved it. We ate outside and it was just perfect weather and a view of downtown Charleston. Plus, we had some of THE BEST wings we have ever had! 9. Get a Blowout from the Dry Bar (book an appointment here): Confession: before we had even made any dinner reservations or planned anything we were doing on our trip, I had booked an appointment at Dry Bar for Saturday afternoon before we went shopping. If you've never been to a Dry Bar, it's SUCH a fun experience. This would be a great option too if you're going to Charleston for a girls' trip. 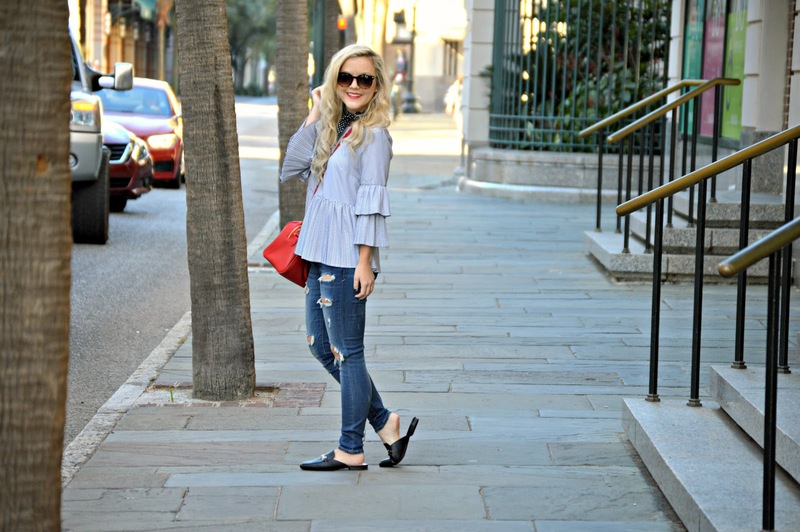 I got the "Southern Comfort" style because, well, when in Charleston, right!? 10. Shopping on King Street. Our hotel was really close to King Street, so AMAZING shopping was just a quick walk from our hotel. They have literally EVERYTHING you could dream of, and if you follow me on Instagram, you know I shopped at H&M & picked up a little treasure from Louis Vuitton. It's definitely a must if you love shopping. We ran out of time but there are so many amazing stores there! 11. Tour the Calhoun Mansion (information here). We were introduced to the Calhoun Mansion on our carriage ride, and when the tour guide told us that the shots of Allie's summer home, in The Notebook, were filmed there, we knew we had to see it! I would highly recommend taking a tour. It is the largest single family residence in Charleston! 12. Dine at Magnolia's for dinner (here): This restaurant is another Charleston classic. It has yummy food from the fried green tomato appetizer to the pumpkin cake dessert. We made reservations prior to our meal here! 13. Stay at King Charles Inn (here). We absolutely loved the convenience of our hotel, and not to mention it was a very comfortable room and lovely hotel!!! 14. Buy some pralines to take home! Need I say more? One of the best souvenirs you can buy. Besides a new LV purse. Lol.